Shon Walters is Dayton resident and a lifelong wood artist who creates in his Wayne Ave studio, as well as for Stivers School for the Arts. As the second annual ArtFest gears up for celebration on Sunday, September 17th at Community Park on Factory Road in Beavercreek, the committee was busy reviewing nominations for this year’s Featured Artist. From water color teachers to flautists, all nominees were worthy in their own right but one stood out as unique as his sculptures. Shon Walters is Dayton resident and a lifelong wood artist who creates in his Wayne Ave studio, as well as for Stivers School for the Arts. Shon’s wooden masterpieces vary from functional to non-functional that accentuate the natural beauty of the wood grain, rich color and years of fine-tuning skill. “I used to do a lot of whittling when I was young. There was something about the removal of the chips… there was a fascination with that”, says Shon. In the 10th grade, he filled a friend’s truck full of driftwood he found near a Cincinnati River bank and started to create sculptures focusing on his at-the-time fascination of African masks which soon turned to creating frames for his own paintings. If you frequent Spinoza’s in Beavercreek or Toxic Brew in Downtown you have seen Shon’s work behind the bar donning their taps. 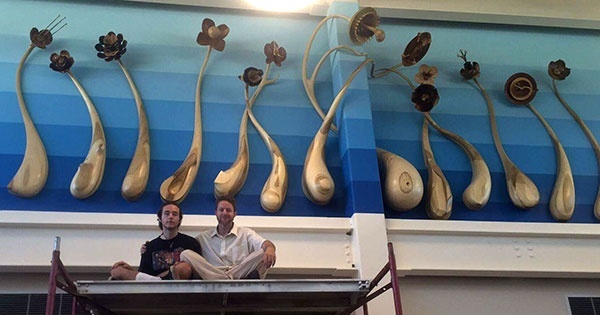 Some are large organic shapes that take time for engineering, sanding and installing like that seen at the New Lebanon library which has a large scale installation of his sculptural flowers. Shon’s understanding to the value of handmade and encouragement for the public to associate themselves with the work for its time and process led them to honor him at this year’s event. As a festival celebrating all things creative, we encourage our artists to engage with the audience about their processes and materials. Time and skill go into every work of art from jewelry to pottery to a hand-crafted table. For many, their art is their skilled trade which takes time, planning and precise execution. Visit ArtFest to learn more about what your community artists and organizations have to share and take a few minutes to value the craft in front of you. Shon Walters can be contacted through his website, Eccentric Wood by Shon Walters at shonwalters.com and will be available at ArtFest to see his works in person for sale and for custom orders. More information about participating in or volunteering at ArtFest is available at Infusion-Art.org/artfest.